over the weekend, we celebrated ryan's mom's birthday. 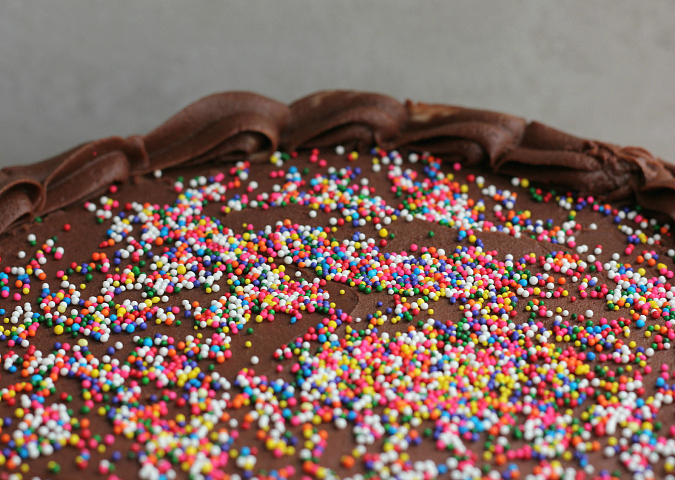 for dessert, we made a three-layer yellow cake with chocolate frosting, topped with colorful nonpareil sprinkles. 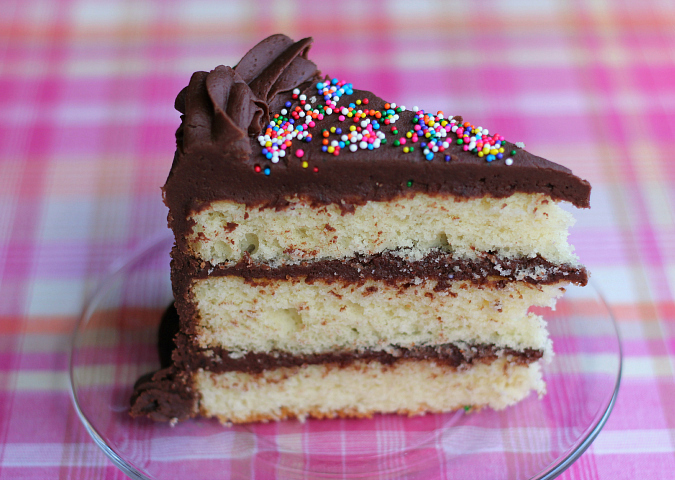 yellow cake with chocolate frosting is such a classic for birthdays. 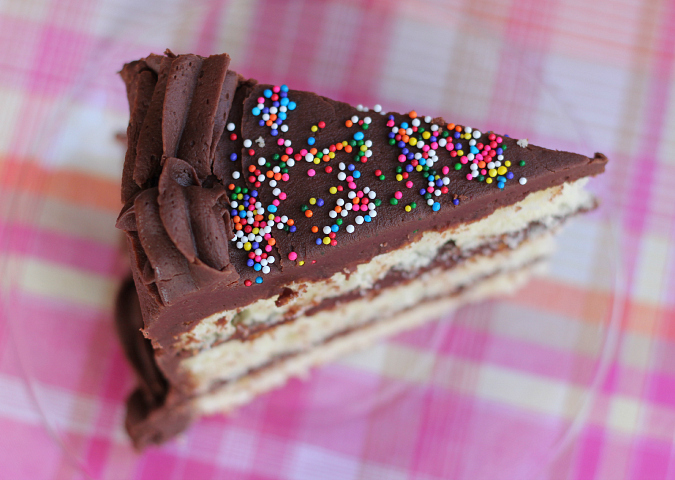 one of our favorite bakeries to visit when we are in nyc is magnolia bakery. they are known for their delicious cakes and cupcakes, and one of their most popular items is their traditional vanilla cake. this classic yellow cake recipe is adapted from the magnolia bakery cookbook, which ryan bought me a few years ago for christmas. this cake is easy to throw together and holds up well as a layer cake. the cake's consistency is somewhere between a traditional cake and a sponge cake. 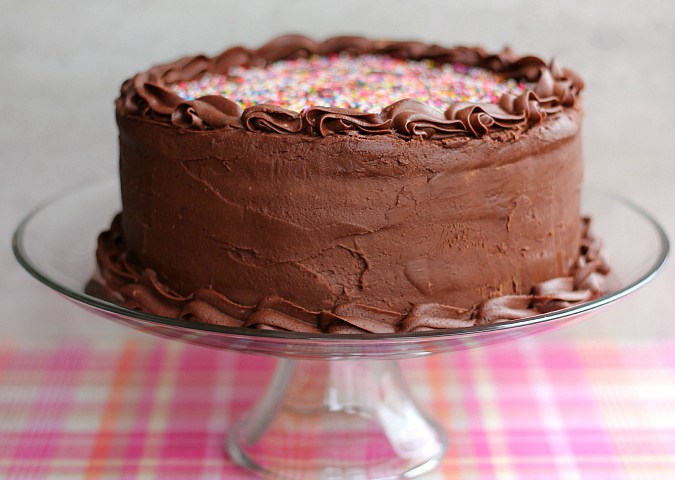 it has a great flavor that pairs perfectly with rich chocolate frosting. it's an ideal cake for a celebration or for any day of the week! to make the cake, preheat your oven to 350 degrees F. grease and flour the sides of three 9-inch round baking pans and line the bottoms of the pans with parchment paper. in the bowl of an electric stand mixer fitted with a paddle attachment, cream the butter for 2 minutes. add the sugar and beat until light and fluffy (about 3 minutes). add the eggs, one at a time, beating well after each addition. in a separate bowl, sift together the flours and the baking powder. add the flour in four parts, alternating with the milk and the vanilla. beat well after each addition. divide the batter evenly among the three pans. bake for 25 minutes, or until a toothpick inserted into the center of the cakes comes out clean. once baked, allow the cakes to cool in the pans for 10 minutes before removing the cakes from the pans and allowing them to cool completely on a wire cooling rack. to make the frosting, in the the bowl of an electric stand mixer fitted with a whisk attachment, cream the butter. add the cocoa powder, 2 cups of the powdered sugar, 2 teaspoons of the cream, and the vanilla. beat until combined. gradually beat in the remaining powdered sugar and cream until you reach your desired frosting consistency. 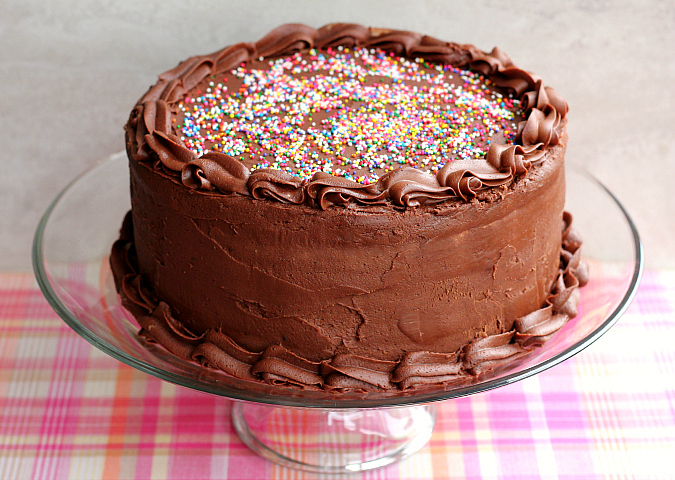 frost the cake once it has cooled completely and top with colorful sprinkles. We really enjoyed that cake. The chocolate frosting really did the trick. Unfortunately, we do not have any more left.